This tree-rich area is well known for its hiking trails, big game, outdoor adventure activities and birding. The imposing Kranskop Mountain that rises above the surrounding landscape is a natural beacon on the N1 Highway that runs between Pretoria and Polokwane en route to the Kruger National Park. Modimolle Funky Stay Backpackers offers no-frills, affordable overnight accommodation in colourful rooms within A-frame buildings. 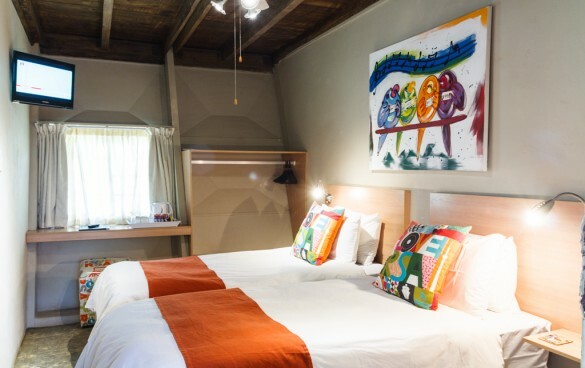 With its quirky South African ambience, this small hotel in its Bushveld setting is a convenient base for budget-conscious business travellers, families and school or church groups. Modimolle Funky Stay Backpackers not only offers trouble-free access to the N1 and Modimolle, but is also close to numerous outdoor and adventure activities in the area. Its location –12 km from the N1 highway – offers easy access to Pretoria, Polokwane and OR Tambo International Airport. While situated close to the R101 to provide convenient access, a row of tall trees lining the road dampens out traffic noise, so that guests can relax overnight to the sounds of the bush. The R101 also passes other Limpopo establishments in South of Africa’s portfolio. Guests can therefore also choose to visit any of these Waterberg properties including Shangri-La Country Hotel (14km outside Modimolle) and Elephant Springs Hotel (in Bela Bela) for a spot of afternoon tea or an unforgettable meal day or night. In addition, barbeque enthusiasts can enjoy making their favourite meal in the hotel’s outdoor barbeque area. 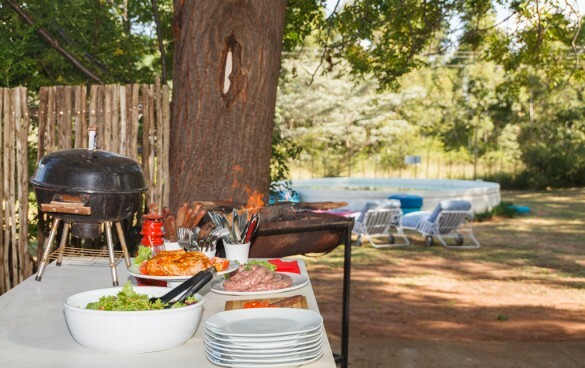 The barbeque boma, located between the hotel buildings, is open to all Modimolle Funky Stay Backpackers guests. In association with Essence of Youth, we also offer a selection of in-room massages and treatments. To view the spa menu and pricing, click here. Note that certain treatments can not be given at Funky Stay and should you wish to experience these, we will gladly refer you to the on site Spa of our sibling hotel, Shangri-La, where other treatments may be enjoyed. What distinguishes Modimolle Funky Stay Backpackers from other overnight accommodation establishments in the area is its ideal Bushveld location in the Waterberg Mountains. Guests are able to stroll among the trees and small ‘koppies’ (hills) in the bush surrounding the hotel. Driving up a short gravel road to the hotel, grazing cattle and beautiful trees provide a rural ambience. 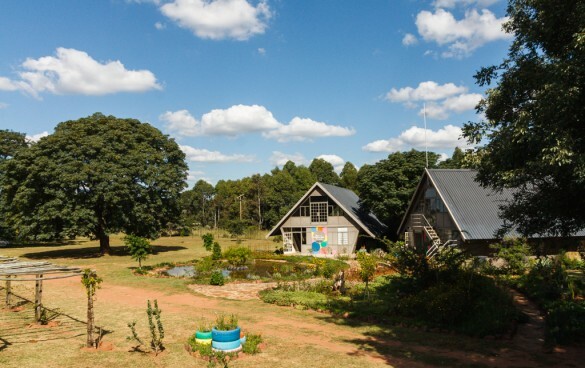 Modimolle Funky Stay Backpackers comprises three A-frame buildings that house its 12 rooms. These overlook a tranquil pond set in the Bushveld surrounding the hotel. The hotel has 12 comfortable bedrooms situated in three A-frame buildings. Decorated in cheerful chic style with rustic screed flooring, colourful South African furnishings and decor liven up the interiors. Access to the bedrooms are from the side hallway that runs along the rooms leading from the communal unit entry. Modimolle Funky Stay Backpackers’ hotel rooms are all non-smoking. They feature tasteful wooden furniture, a desk as well as ample cupboard space with an open closet that fits into the rustic space of the A-frame architecture. Additional homely touches enhance the basic features of each room to ensure a comfortable overnight stay. These include a coffee/tea maker and flat screen television with select satellite channels. From Pretoria: Follow the N1 towards Polokwane (Pietersburg), take the Modimolle (Nylstroom) off ramp at the Kranskop Tollgate. Turn left at the T-junction and follow the road towards Modimolle (Nylstroom). Turn right into Thabo Mbeki road (The Outdoor shop on your right hand side). Travel for approximately 4km until you reach Modimolle Funky Stay Backpackers on your left. From Polokwane: Follow the N1 south towards Pretoria; take the Modimolle (Nylstroom) off ramp (R101). Continue on this road for approximately 16km until you reach Modimolle Funky Stay Backpackers on your right. Guests at Modimolle Funky Stay Backpackers that use the hotel as a business base or overnight stay can choose from a diverse range of activities in Modimolle, Bela Bela (formerly Warmbaths) and the surrounding areas of the Waterberg. Most of the activities are within a 10 to 60 minute drive away. Modimolle’s lively town centre is just four kilometres away from Modimolle Funky Stay Backpackers. The town offers various attractions including the Modi Mall, restaurants, tea gardens and shops. Several Health and Beauty Spas in and around Modimolle and Bela Bela (40 kilometres away) offer wonderfully indulgent pampering spa experiences. The Hydro (at Forever Resorts in Bela Bela) is famous for its therapeutic hot mineral springs. It offers a variety of specialised beauty treatments including full body massages, pedicures, manicures and hydrotherapy etc. Walk or cycle in the Nylsvley Nature Reserve, 30 minutes drive away and situated in Africa’s largest inland floodplain. Open all year round during the day, this 4,000 hectare protected reserve offers a unique biodiversity of plant and animal life, including roan antelope, Tsessebe buck and approximately 370 bird species. During peak floods, the flood plain becomes a critical nesting and feeding site for over 80,000 migratory birds. Tee off for a game of golf at Koro Creek Golf Estate, an 11-minute drive away.